A link for my family, and anyone else in this situation: You've come back from the vacation of your life, and you want to share. Your vacation photos should leave them wanting more, not less, and definitely not caffeine. Read "The Ultimate Guide to Memorable Travel Slideshows." Some tips: Choose one or two evocative pics, not 8 of the same thing. Mix up people with landscape, for variety. Insert movie clips occasionally, to spice it up. Software to make this easy: Surprisingly difficult to make a simple animated slideshow, it turned out. I tried a few programs that were on my computer and finally got results from Photoshop Elements, which will export a nice slideshow movie to Premiere Elements for creation of the DVD itself. On the Mac, the settings and process was a little hidden and didn't offer the same control over the zoom/pan effect, but you can achieve the same results with iPhoto and iDVD. It seems that Picasa will do it (haven't tried). Some DVD authoring apps will, and any movie-making app, but you really want some tools built for slideshows to make it easier for yourself. Disclaimer: I've definitely violated these rules too, so this was a good reminder to me, too. 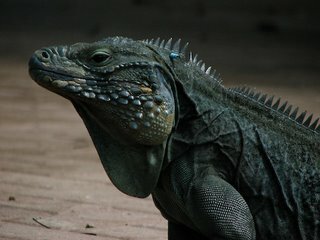 I went to Grand Cayman for snorkeling, and while it was excellent, I saw a lot of unexpectedly interesting animals. The sting rays at Sting Ray City were amazingly interested in people. I guess they know a good food thing when they see it. You are swamped by them when you drop anchor in the shallow waters. The story is that fishermen cleaned their catch out there to avoid mosquitoes on land, and one smart guy turned it into a tourist attraction, undetered by Steve Irwin's sad demise at the tail of one. 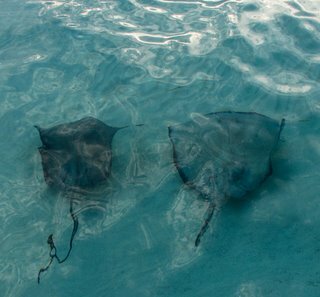 (Here is an article on "sting ray injuries survived.") They feel mushroomy on their underside, and sandpapery on the top side. 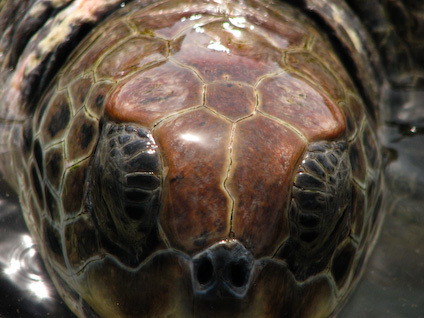 Finally, turtles are farmed for food and tourists there. I found the crowding conditions a mite disturbing, but it's undeniably an aesthetic experience to see all those shells and mottled skin up close. Also, undeniably expensive to get in. I did it for the photo opp, and the chance to snorkel in a private lagoon with turtles in training. Training for people like me touching them while swimming, I guess. In said turtle park were also pretty birds from the Caribbean, which you can see in the critter photos. When I got home, I discovered a newly arrived National Geographic Traveler mag had an article reviewing destination islands, scoring them in part by how much tourism is affecting them. [I discovered I'd been in a few of their top 20 already, and added more to my destinations desired list.] They were pretty much on target about Grand Cayman: "Exceptional diving and snorkeling but banking defines the island. Tourism is heavily weighted to cruise ships." I'd add: with huge resorts, and retirement McMansions as seen in Florida. But it was the best walk-off-shore-snorkeling I've found yet. Cayman photos here: turtles, lizards, birds, rays, beaches. I've been delinquent in blogging, due to travel (Cayman Islands for water, pics coming) and a whole lot of work. Speaking of travel, National Geographic's Adventure Travel magazine site has a tool that offers reviews of adventure travel companies. Pretty cool. I'd spend all my time on these trips if it weren't for the money, of course. For a more eclectic and perhaps affordable set of options, use the site a friend recommended, from which I found my trip to Morocco: Adventurecenter. They aggregate trips from many companies, and have reasonable search options including price. Airfare is usually not included, and you'll find that it's the biggest issue with most of the more interesting destinations (read: off-the-beaten track). If you're afraid of traveling to "exciting" places alone (as a woman, I am), this type of group travel can be really fun. For other resources on cheap travel, I recommend this site: Worldscheapestdestinations. It's not pretty, but the info is good. I caught up on the latest print version of Fast Company on a flight, and I have to admit I'm loving it via print. I read almost ever word, while on the site I just browse occasionally. And now I can point to fun stuff, since the mag is all online. First, some slightly irksome "news": ebay is trying to revamp itself in the face of flattening numbers. Like a lot of business press, this makes a hero-to-be out of a new exec hire, Matt Carey, CTO. He learns in paragraph one during a focus group that the site is hard to use. He determines to "make the buying process efficient and fun again." Having heard the industry gossip for years about the company -- mostly from designers who've left in droves -- the people who knew it was hard to use and knew it needed usability and design work weren't listened to when it might have prevented flattening numbers in the first place. Too risky to change what was seen as successful! Till the big picture numbers start to look scary, and the competition spreads, I guess. That's when it might already be too late. A reminder that design and usability are strategic competencies not handled well by most executive boards at most companies. On to more fun: Nightmare in Boomtown, a story you could not make up. With all the twisted personalities at work, it would make a good movie. It's the saga of a fallen rabbi gone to Kazakhstan to do business, and getting eaten alive by the corrupt system and an angry gangster rival who wanted a $5 million dollar discount he didn't get. It probably cost a few hundred thousand, but the ex-rabbi gets locked up in a Siberian jail for a year and virtually abandonned by any officials who should care. In October 2006, after 11 months in Siberia, Seidenfeld was loaded aboard a prison train to be extradited from Russia to Kazakhstan. For 32 days, he was stuffed into a 3½-foot-by-7-foot cell in a boxcar with one toilet for 60 convicts. His fiancée, Natiya, doggedly followed the train on its 3,000-mile journey, intercepting it as it stopped at detention centers. Word of the presence of a wealthy Western businessman had traveled fast among the prisoners, and Seidenfeld learned early on the importance of isolating himself as much as possible. Natiya secured lawyers wherever the train stopped, bribed officials, and did whatever she could to make sure Seidenfeld traveled in his own cell. He kept his head down while shuffling to and from different prison stops to avoid the batons of the more-sadistic guards. "If I had been kept with the rest of the population, I might not be around today," he says.